The lights go out and the screams instantly reach fever pitch. 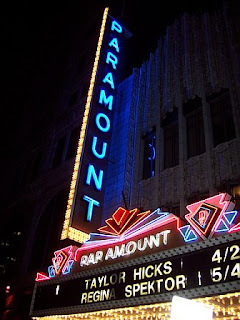 I am standing in the Paramount Theater in Denver. I am with my mom. I am at a Taylor Hicks concert. 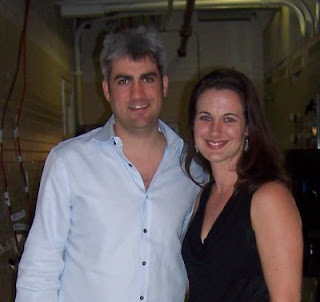 When the opportunity to talk with Taylor Hicks about music kind of fell directly into my lap (with an opportunity to take my mom to his show), I just couldn’t say no. 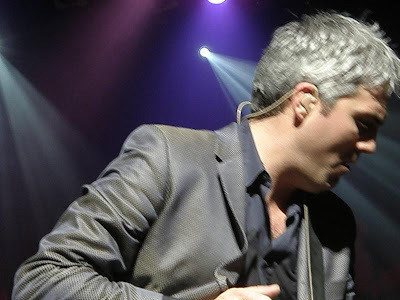 One thing I’ve always thought about Taylor Hicks since the first time I saw him on American Idol is this: Despite of the avenue of an embarrassing pop reality show, this is a man who truly loves music, and who truly loves performing music. He feels it deep inside, and we both share a strong and abiding appreciation for soul greats like Otis Redding, Ray Charles, and Sam Cooke. At only 31, Hicks is a bit of an anomaly amongst folks in my generation. But in a good way. HB: What role has music played for you throughout your life? TH: I guess having an outlet of some sort â€“ music was that outlet for me. Music replaced a lot of things that were missing in my life at that time. Luckily I was listening to Ray Charles and soul music, and that’s when I started replacing the things that were missing with that love of music, it balanced me out. 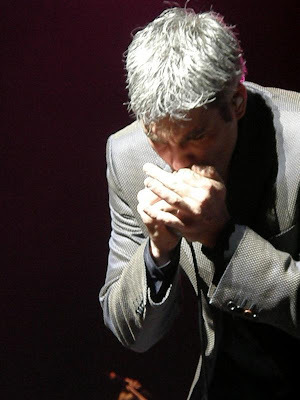 Through singing and then playing the harmonica — it just kind of took off for me. I don’t know if it found me or I found it. The first record I ever heard in that genre was probably Otis Redding, then Ray Charles hit and I just kind of took off with Ray, studying everything I could get my hands on from him. As a kid, you know, from the time I was . . . eleven, I remember feeling like I was going to keep good music around, or at least be one of the players involved in keeping good music around. And it wasn’t a selfish feeling, it was more selfless feeling, for the good of the music and people, maybe like a conducer, that’s what I’d like to be. Let good stuff flow through me, keeping it around, live â€“ the way that the legends perform it. Do you ever feel intimidated by that? That’s a pretty tall order. Well, you’re always feeling the weight, you know, of trying to be the best artist you can be, so I think that’s just being an artist. I don’t think any artist is ever content, they want to describe the landscape, talk about it, and not be content with . . . not moving. Your first two albums were undertaken from an assumedly low-budget, very independent standpoint. I’d like to know a little about the process for you of making the new album, working in a big studio, doing songs written by Rob Thomas, Marvin Gaye, some Ray Charles samples, a full bandâ€¦. You must have felt a bit like a kid in a candy store. Yeah, it was cool, learning how to be a recording artist in the truest sense. I think having all those tools definitely helped. You can paint the picture better with a better budget. Like, each song is a blank canvas, your instruments are your paintbrushes. You know? I didn’t have many paintbrushes to work with before. So that was cool. But this album came really quick — it was under time constraints, so I couldn’t paint it completely, because you know, in 5 weeks we had to record it. So I had to record on instinct. When I do future albums, I’ll have more time. In the future I’ll need to take more time with my own art, my own songs, the songs of others, production, mixing, I wanna have more time to do all that. Have that time to create and be an artist. I think Fall, I will probably â€“ I might be touring this record for the next year, but I think in the Fall I want to block some time out for writing. I love Ray LaMontagne, and I thought it was great when you were talking about your choice to cover his song “Trouble” on American Idol and saying “my whole goal is to let people see about that music that’s real and not to let it slip.” But did you ever feel like you were speaking . . . a foreign language during the time you were on AI with tastes for “real” music? To a certain degree, yeah. It was a very tough task. But I found that the love of performing, I mean that was my true gig. You listen to what’s popular now, pop radio, and . . . I really want to keep real music in the forefront. I’ve been touring that idea, I’ll be touring that idea forever. I went to see Ray LaMontagne right when that Trouble album came out, about two years ago. I like him. I like his recorded music better. He’s obviously, it seems to me, a performer that doesn’t really like being there. But I think he can hide behind the confines of his own words and music in the studio and not have to face that, you know? That’s what I want for him – it’s tough when you see an artist go through . . . I don’t wanna say torture . . . but a similar thought process there. If you could do a duet with any musician living or dead –just for sheer personal enjoyment and love of the music and not for any commercial purpose or audience– who would you choose? I would have to say Van Morrison probably, live. I would like to play live with Van. I studied his stuff, digested a lot of what he did on stage – and Otis Redding, those two live performers. If you’ve ever seen Otis live, see a lot of people haven’t seen that â€“ it’s a lost art, what he did. He was a brilliant performer live. And of course Ray (Charles). Finally, what’s been the coolest thing you’ve gotten to be a part of in these last two years? Oh, going to Ray Charles’ studio. I was picked up on the same day that I was on the cover of People Magazine. That same day. You know, it was crazy. There’s not so many people that get to do that. I got to play on his piano. While I was there, I got to go down into his personal vault. Now, I’ve been interested in Ray Charles Live in Tokyo. We went down to his music vault, and everything he had was labeled in Braille, so nobody knew what it was — only him. The first thing that I picked up, I opened the box up and it was [the tapes for] Live in Tokyo by Ray Charles, and it freaked everybody out. It felt so right. It was really cool, that was a really cool experience. That validated me being there. But . . . you know, surrealism has lost its luster with me, you know what I mean? Because I just take it for what it is and hopefully have one day to reflect on everything I’ve done, because I can’t right now. Maybe open the file up someday. I couldn’t help but smile when I saw Taylor on stage later that night because he was so clearly living his dream with purpose and joy. Even if I may not listen to his latest album, I can so purely appreciate seeing someone who has accomplished exactly what they are passionate about doing in performing music for the (very enthusiastic) masses. Taylor’s been eking out a living for 15 years performing as a live musician, honing his craft in dive bars and at frat parties, hoping to “make it” so that he could afford to pursue what he feels he is meant to do. It’s easy to make fun of American Idol, believe me I do it all the time (even the whole single season I closet-watched it), but it was harder for me to put aside the joking and just enjoy his soulful enthusiasm in leading the show. Which, I’ll have to admit . . . I ultimately did. Some photos are mine, others are from this great collection. Interesting, honest and yet weirdly positive explanation of his take on Ray LaMontagne. Nice to hear Taylor still giving real answers after all the Idol media frenzy. The man does know and love his music. I also really enjoyed his concert though it was a different one and early in the tour. I would love to hit another this summer and see how his music and performance has evolved. Beautiful interview. Insightful, thought-provoking, and interesting. You didn’t go for the same old, same old. You managed to get some really good answers out of The Man. Thank you for that. I especially liked what Taylor had to say re:Ray Lamontagne. He gave me something to think about. very refreshing questions. This was a great interview. Now ya see? I have a long standing “beef” going on regarding LaMontagne but I still love his music and unlike Taylor, I like him LIVE better than recorded. I cant imagine a more electrifying experience than Taylor and Van together. Excellent interview! Thank you for creating a thoughtful set of questions for Taylor instead of repeating what we’ve all heard before. You could tell Taylor was appreciative because of the depth of his answers. Great job!! Thank you for sharing this interview. So many interviews are conducted by people who go by a list of six to eight questions which are always the same. You went for and understand Taylor’s passion. The music. That is why you got a great interview. Appreciate your approach more than you know. Just want to add my thanks, Heather for the questions you asked. You showed interest in Taylor’s thoughts as a serious artist, and he answered in the same vein. That’s so much better than questions like “who do you think will win American Idol this year”, which is the kind of fluff everyone else is asking him. He gives rote answers to those things because he is not interested in that, he is interested the music, and his opportunity to do what he can to keep the good stuff out there. Heather, what a great interview. I was reading earlier on another blog and someone posted a link to an another Taylor interview where the writer implied that he was a horrible person to interview…sorta like trying to interview Bono. The problem was the guy asked very unimaginative and boring questions. You on the other hand came from a music lovers perspective, therefore you got more than a yes and nod from Taylor. Good going! I too was interested in his take on Ray LaMontagne. I remember watching him on Jay Leno last summer I believe. I commented to some friends how uncomfortable Ray seemed to be. It made me sad, because thanks to Taylor, I am head over heals in love with RL. He’s incredible. Performing live seems difficult for him. How sad, he’s really darn good at it. I enjoyed this entry so much, I think I am going to nose around a little. I heard something about Sam Cooke? Peace. What an amazing post as always. You’ve got so much indie-cred now, it hurts. I love that picture of you and Morrissey. Ahhhh, Bruce. Had me laughing out loud at that one. Indie-cred? Off the charts, right? Heather, enjoyed your interview , you plugged into the “soul” of Taylor and gave him an opportunity to discuss the music in an intelligent and candid manner. what could any of us want more than that? December 10th will mark the 40th anniversary of the death of Otis Redding. “Live” doesn’t begin to describe Otis. Same show…My Girl..stay til the end. no way. those pics are photoshopped. theres no way. oh, jesus, you know the dismal limits of my photoshopping skills…. Jesus is miffed because his request for an interview wasn’t granted. I picture myself burning in hell for this. Thank you for such a great interview. I thoroughly enjoyed reading this. You asked some obviously very well thought-out questions, and I was thrilled to get a little more insight into the man and his music. Heather, congrats on getting an interview with him where you had the opportunity to ask him some thoughtful questions. I’m a relative newcomer to your blog, so I might have missed it, but where’s the picture of you and Morrissey???? That I want to see. And T. Moore, I think Taylor is sometimes disconnected with this current band. I agree that the shows with LMBO are more intense and have a sense of urgency that’s lacking with the polished tour band. Time will tell where he eventually goes, but I hope he doesn’t stray from that early, more pure sound. Heather – thanks for sharing! Loved reading an interview with intelligent and relevant questions that reflect your understanding of your subject. As a result you got great responses. Taylor’s mission is a one that’s bringing a lot of joy to a lot of us–especially to some of us who love music but got fed up with the canned stuff. I look forward to years of music and great performances from this guy. Heather, what a great interview. I was reading earlier on another blog and someone posted a link to an another Taylor interview where the writer implied that he was a horrible person to interview…sorta like trying to interview Bono. bono is a horrible person to interview? can you verify this for me with your nifty AI connections, heather? And maybe it’s not fair to expect a guy plucked from the Alabama bar circuit to give interviews like Bono overnight. But would it kill him to try? Heather, Nice to see someone put time and thought into their interview questions. I am also enjoying perusing your site. Great job! And if you get an interview with Jesus, can you ask him a few questions for me? I’ve been wondering about a few things lately. Thanks for a well thought out interview…the comments about Ray L. were certainly food for thought. Just discovered your blog through a friend and I like what I see. Great interview…not the usual drivel….very well thought out to get some answers to some insightful questions. Great interview! You were right in front of me taking pictures that night. Denver was such a great concert! Too bad we couldn’t take pictures! Thanks for connecting my Beacon pictures for your fans to enjoy! I appreciate the acknowledgement!